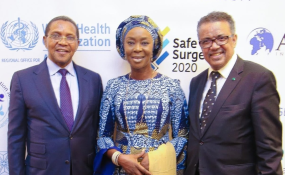 New York — Toyin Saraki yesterday chaired the forum on Child Health and Malaria during the Access Challenge Universal Health Coverage Conference during the United Nations General Assembly. The forum was one of four key areas explored by the conference, which also focused on Maternal Health, non-communicable diseases and neglected tropical diseases. The four forums will combine to create a Universal Health Coverage Policy Report with key recommendations for Governments, global institutions and organisations to achieve health for all. The Child Health and Malaria panel consisted of Mr. Kevin Watkins, CEO, Save the Children UK; Dr. Kesete Admasu, CEO, RBM Partnership to End Malaria; Dr. Katharina Lichtner, Managing Director of the Family Larsson-Rosenquist Foundation; Dr. Stefan Swartling Peterson, UNICEF, Chief of Health Section; and Dr. Henry Mwanyika, PATH, Digital Health Regional Director for Africa. Toyin Saraki, who herself received the Speak Up Africa Award for Citizen Engagement at the United Nations General Assembly in 2016, also congratulated the awardees this year, which included Agnes Binagwaho, former Minister of Health in Rwanda, Achim Steiner, Administrator - United Nations Development Programme, and Regional Director for WHO in Africa Dr Matshidiso Moeti. As the United Nations General Assembly continues in New York, Mrs Saraki is further scheduled to deliver high-level UN advocacy speeches. Toyin Saraki is Founder-President of the Wellbeing Foundation Africa, Global Goodwill Ambassador for the International Confederation of Midwives, Special Adviser to the World Health Organization regional office for Africa and Wife of the Senate President of the Federal Republic of Nigeria. Read the original article on Wellbeing Foundation.